Living in a house or apartment with an open floor plan really offers a bunch of advantages. Having a more spacious layout of rooms, enjoying seamless flows from one area to the next, and being able to carry on a conversation with your significant other while one is prepping dinner and the other is (hopefully) setting the dining table, just to name a few. However, open floor plans also present a slight problem – with no walls to create barriers it also means there are no physical separations to distinguish the one room from the other. How then do you satisfactorily divide the one area from the next? How do you announce to your guests where the dining room ends and the living room begins? For your kitchen, there is a very simple solution that is very much in vogue these days: the island. We at homify enthusiastically approve of this option, firstly because it allows the cook to socialise in style with the guests while busy prepping that culinary feast – no walls mean no getting cut off from the rest of the party. 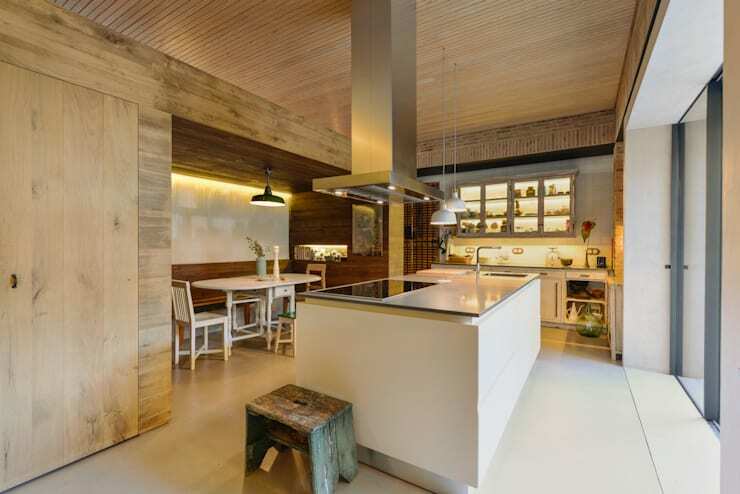 Secondly, it adds a lot of functionality to the kitchen, as an island offers sufficient surface space, either to work with or to use for display or storage (such as your unique collection of overseas cookbooks). What is also terrific about kitchen islands is that they are available in a multitude of styles and colours, so your chosen one can be a perfect blend (or a striking element) for your kitchen. Wait, aren’t carpets meant for purely decorative purposes? Of course not! In a very subtle way, a carpet can also create a separate area, and that is why we have included them on our list. There is nothing simpler then laying down a carpet in an open plan which houses a living room and dining room, neatly (yet firmly) laying down the rules of which area is which. 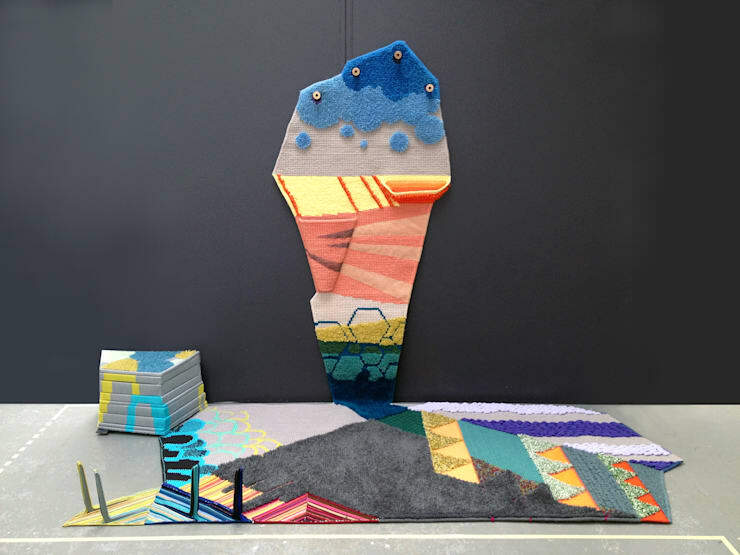 Carpets or rugs can be chosen in any imaginable colour, even strange-sounding hues you’ve never even heard of (razzmatazz, anyone?). 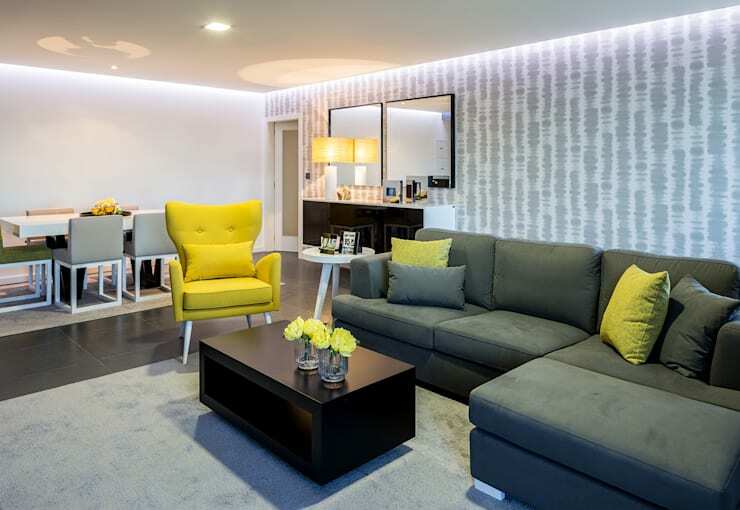 And things really take a stylish turn once we add patterns and swirls to enhance our rooms’ decor and colour palettes. High-pile, low-pile, sisal, fluffy… there is a world of rugs and carpets just waiting to be explored, each one guaranteed to make your chosen area as striking as you want it to be. Don’t skip this part, as we don’t mean bland white walls. With some creativity and clever planning, a wall (even one that doesn’t stretch from corner to corner) can become a groundbreaking focal point of a room. A wall possesses more possibilities than simply a paint colour (or displaying a few paintings). There is an entire world of wall coverings out there! Wallpapers are available in any shape or pattern you can think of (even a few you can’t!). 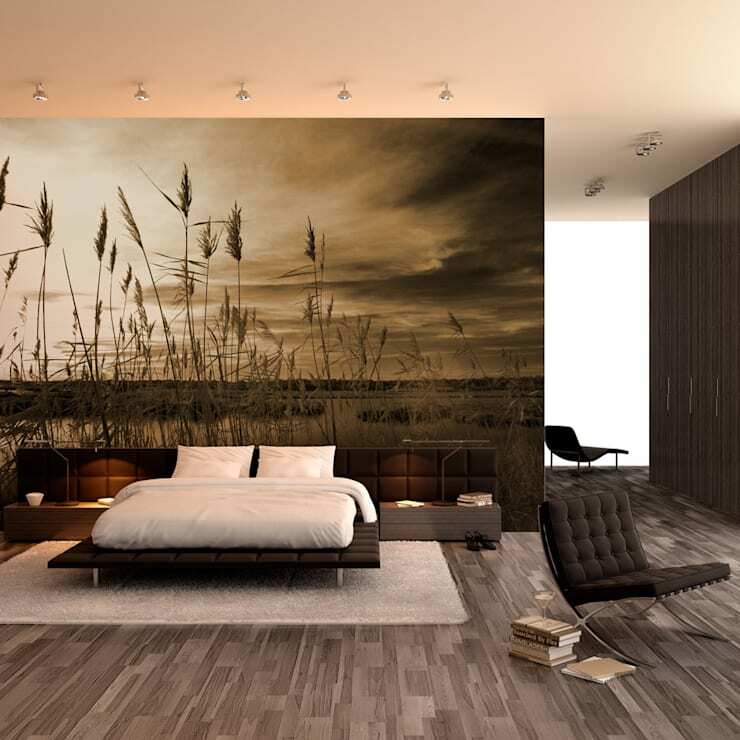 Wall murals or photographs are also a very popular trend, where an entire wall is used to display a scene, as is shown in our example above. Notice how strikingly that wall art embellishes the bedroom, complements the colours, and highlights the area of the bed. Quite unique and tasteful. If you have a large bedroom and you wish to divide your sleeping zone from, example, your dressing or storage area, we recommend this solution. From the walls to the floor. The logic behind this solution is very similar to the carpets, since this manner of division also takes place underfoot. Perhaps you may think that using two distinctly different-coloured tiles for two areas in one room (such as red for the kitchen and light blue for the dining room) might seem a bit off, but we are in love with spreading colour around! Even a slight change in hue (from bagel beige to latte brown, for instance) can be quite noticeable, and firmly distinguish between one room and the other. Although a clever solution, this manner involves slightly more work and planning (and costs) than simply laying down a carpet or rug. 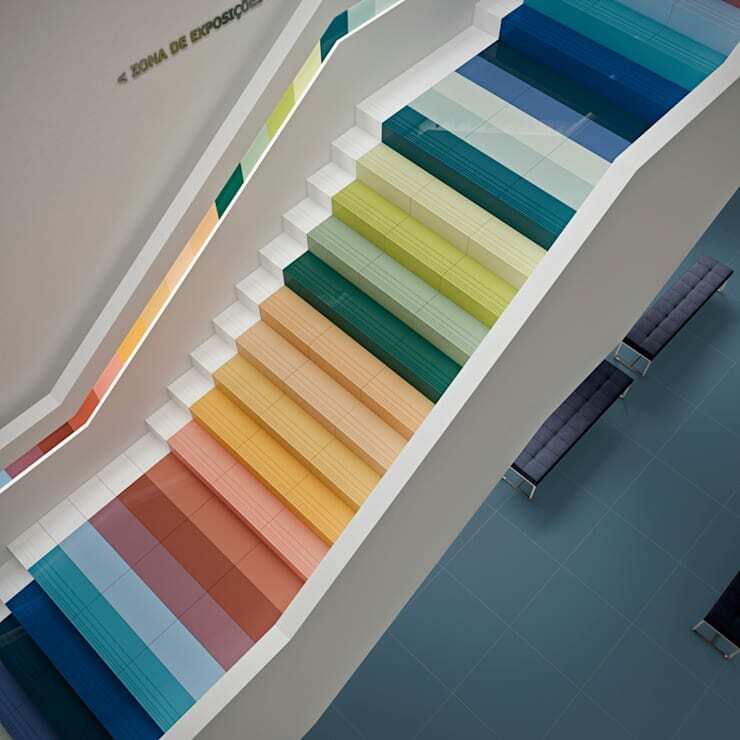 If this is something you wish to achieve, commit to your chosen colour so that it works well with the relevant area’s decor and furniture – unless you are fortunate enough to be able to re-floor your house every so often! Want to announce the start of your living room? Just add seating! A couch, especially an L-shape, is a simple way of separating your seating area from another space, like the dining room. It literally frames the area where the living room starts or ends, which makes it an easy way of distinguishing between different rooms. And if you want to still separate your living- and dining room, yet still want the two to be slightly open to each other? Do what Cássia Lignéa did above – switch the couch with a single-seater which is turned slightly sideways, leaving the living room open and welcome to the adjoining area. Relax and have a seat – we’re with you on the quest to Finding your ideal sofa. If only we could pick up a wall and move it whenever we felt like it… Well, in a way, we can. Except we call these partitions “screens”, not walls. Nowadays, screens are more often used for decorative purposes than functional ones, although their primary purpose upon inception was to separate two spaces (like serving as the partition in a bedroom behind which somebody could get dressed in privacy). Today, it is used to attract attention and serve as a striking decor piece, yet with its (sometimes) solid surface, it does a great job of adding some separation between two areas. We love the particular example we chose above – with its combination of pattern and materials, it poses a presence that is somewhere between noble and flashy. 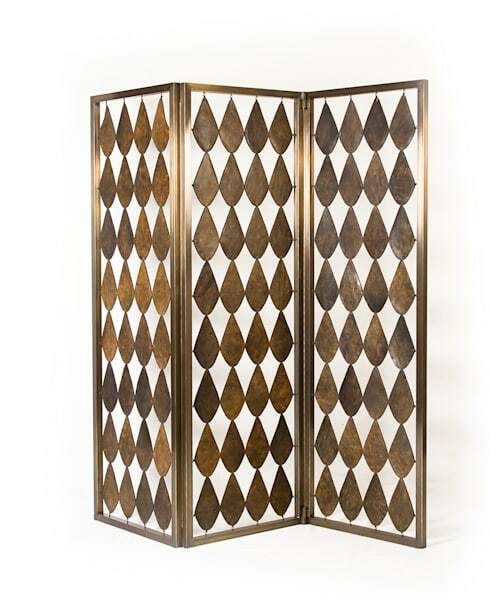 Imagine using this as a divider between your entrance hall and the living room, for example.